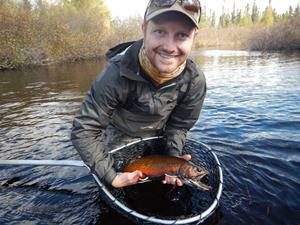 FREDERICTON, New Brunswick, April 16, 2019 (GLOBE NEWSWIRE) -- A new study led by Antóin O’Sullivan, a PhD student at the University of New Brunswick, works to unravel the complex interactions between landscape features, geomorphology, geology, and vegetation - that create vital cold-water habitat for wild Atlantic salmon. This is especially important as rivers and certain wetlands are forecasted to warm with climate change. Antóin O’Sullivan, the Canadian Rivers Institute, Faculty of Forestry and Environmental Management and Biology Department, University of New Brunswick, Fredericton (photo credit: Daniel Hanscom). 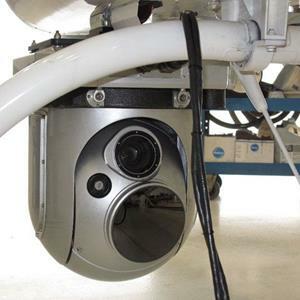 Thermal mapping camera funded by DFO and attached to a helicopter donated by JDI to map water temperatures on the Miramichi River. 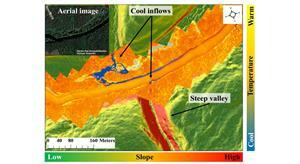 Cains River temperature map in summer showing cooler water (blue) entering from deep valley streams. /EIN News/ -- O’Sullivan and his team used thermal infrared imagery (TIR) to chart river temperature and remote sensed data to identify multiple landscape features on tributaries of the Miramichi River. Pairing these remote sensing techniques with geological maps and statistical analysis they found upland wetlands in the Cains River increased river temperature. O’Sullivan suggests these upland wetlands have a low thermal resilience to climate change. However, the Cains River and its tributaries are more influenced by groundwater in the lower, and steep valley sections; and are better able to weather warming temperatures from climate change. “The science tells us that water temperatures are the result of many factors and we need to customize protective buffers for each stream based on its unique characteristics. There is no “one size fits all” protection for these tributaries and the wild Atlantic salmon that depend on the cool pools they provide in summer and warm water in winter. The support of Fisheries and Oceans Canada (DFO) with the thermal mapping work is very appreciated; we hope it can improve how we manage this resource while safeguarding the dwindling wild Atlantic salmon stocks on the Miramichi.” Dr. R. Allen Curry, Canadian Rivers Institute at the University of New Brunswick.